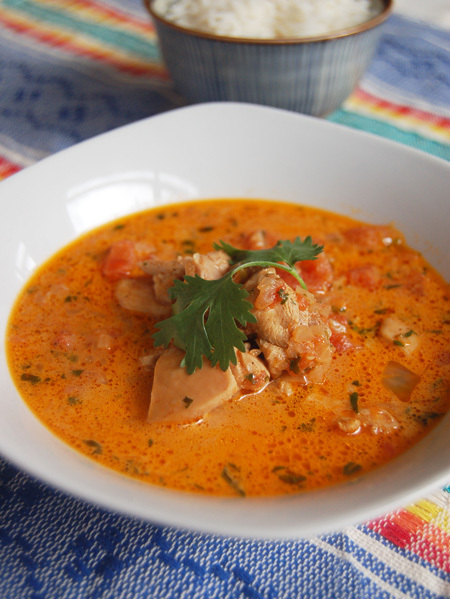 Butter chicken: possibly the most commonly ordered Indian dish in the western world. And with a name like that, I'm not surprised. There is a common misconception, which I almost bought into until I went to the library to do some reading, that ghee, also known as 'clarified butter', is used widely in cooking throughout India. It is not. Clarified butter is known as usli ghee. It is made by gently heating unsalted butter until it liquifies. The whitish bits also known as 'milk solids' are carefully strained with cheesecloth leaving behind the golden liquid which is the usli ghee. This "real ghee", is considered a luxury and is most commonly used in cooking in the Punjab region where dairy products feature more prominently in diet. Usli ghee is also used as a digestion aid, used to relieve rashes and burns and also as used a moisturizer. The second type of ghee, which is more frequently used, can be likened to vegetable shortening. It is usually purchased in bulk and contains various vegetable oils which makes it more economical than usli ghee. Types of cooking oils vary from region to region with the use of coconut oil in the south, mustard oil in the north east and peanut or sesame oil in the north. Back to the butter chicken. Since I didn't have any usli ghee handy, I simply used a tablespoon of unsalted butter. I have to say that it was one delicious meal. So delicious in fact that I considered making it two nights in a row and have been having daydreaming about it ever since. Next week I'm going to try the same recipe with prawns. One of my goals for 2008 is to start making my own curry paste. I'm embarrassed to say that I've never attempted to do so. I think it's a combination of not having a large enough mortar and pestle and also just being lazy. Until I do so, I'll continue to use the excellent Namjai brand green curry paste. 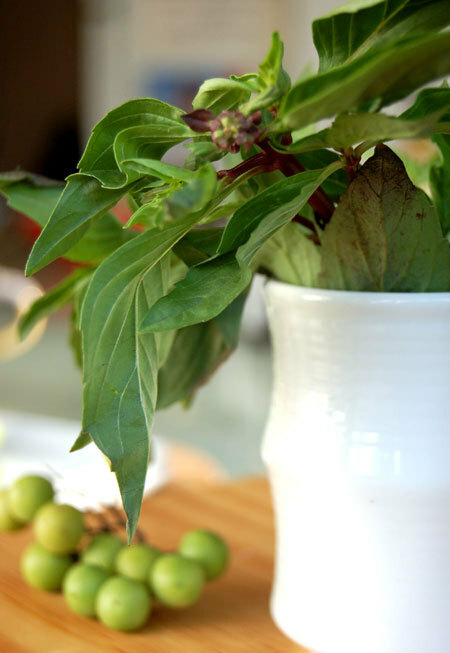 When making a green curry, it is important to try to use Thai sweet basil (pictured below) as it imparts a distinct aniseed-like aroma into the curry. The basil is recognisable by its purple stem and flowers. 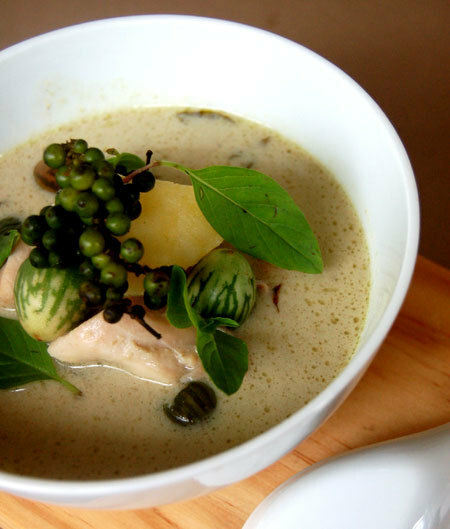 I also add Thai green peppercorns (Prik Thai), which add a sharp bite to the fragant flavours. The next ingredient is a small Thai eggplant called Ma-kheua Phraw. Even though it soaks up the flavour of the curry, it's still quite bitter but delicious nonetheless. If I can't find any of these little eggplants I usually just substitute them with the large purple variety. 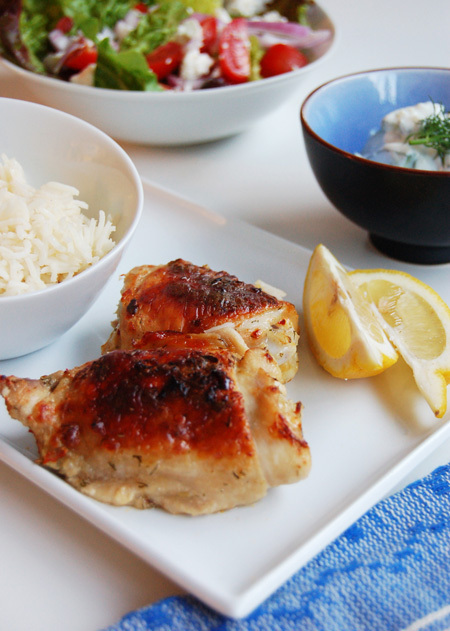 I usually use chicken, however pork, white fish or prawns work really well in this dish. The curry can be served with rice, although I usually eat it with rice noodles which are readily available in Asian food stores. 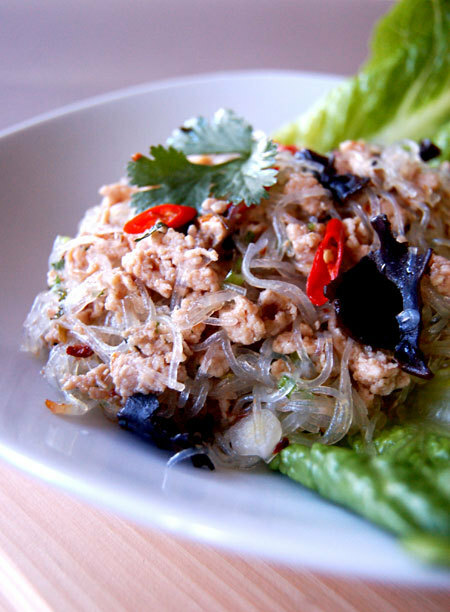 Yum Woon Sen, is a Thai bean thread noodle salad that is often served with either prawns or ground chicken. The 'dressing' is made up of the usual Thai ingredients, naam pla (fish sauce), lime juice and lemon grass. I also added lots of coriander (cilantro) and mint to my recipe. The salad can be eaten warm or cold. The noodles are made of mung bean or potato starch and are also known as 'cellophane' noodles because of their clear appearance. They only need about a minute in boiling water and they're done. I also used mushrooms which I call 'mouse ears' but are actually known as 'Cloud Ears'. My mum used to call them 'mouse ears' when, during my childhood, we lived in Bangkok. The black fungus is commonly used in Chinese cooking. They look exactly like large, crinkly mouse ears and have a lovely, rubbery sort of crunch to them. While they don't have much flavour themselves, 'Cloud Ears' absorb whatever flavours they are exposed to; so in this case it was a mixture of salty, sour and spicy. Anyway, I didn't realise they weren't called 'mouse ears' until the other day when I sent Nic out to buy them. When he arrived at the Asian grocer, and was greeted with nervous looks from the shopkeeper, he called me, suggesting that perhaps 'Cloud Ears' was what I was looking for. An internet search confirmed that he was right and I had fallen victim to another of my mother's deceptions. It's a deception, however, which I intend to perpetuate. In my last post, I wrote about my third time lucky successful attempt at a Thai-inspired soufflé using coconut milk and pandan leaves. I happened to have a few leaves left over so I made another Thai favourite: Gai Bai Toey, which are marinated chicken pieces wrapped in the leaves and then deep fried for several minutes. I have to say, it was some of the tastiest chicken I have ever eaten. The trick is to marinate the chicken for at least 3 hours. The leaves are wrapped around the chicken just before frying where they protect the meat from being overcooked and infuse it with the wonderful pandan aroma. The delicately thin leaves are surprisingly hardy and can withstand being tied in a knot and then deep-fried. Don't be put off by the fact that they're deep-fried: the pandan leaves seem to save the chicken from being oily. The meat is succulent and tender with just the right amount of crispiness on the outside. 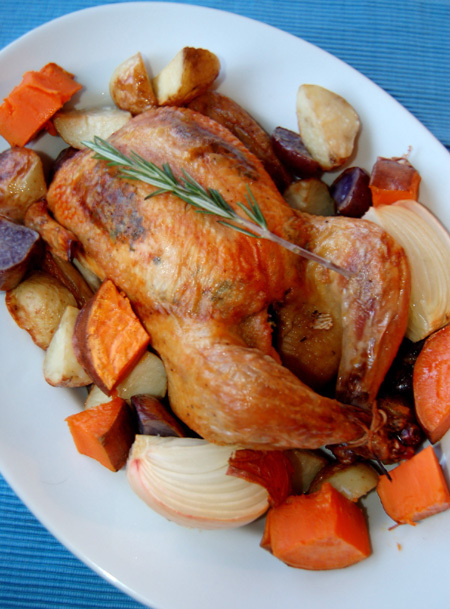 Tying the leaves around the chicken can be a bit tricky but because the leaves are so hardy, if you make a mistake, you can try again and again without fear of tearing them. Just make sure that most of the meat is enclosed in a little parcel. This recipe is an excellent appetizer to serve at parties to wow your guests but they have to be ok with using their fingers a little! They won't be disappointed. My mum grew up on a small farm in rural Queensland, Australia in the 1950s. She had a horse, several cows and a flock of chickens. Each Sunday the family would get together and have a Sunday roast. It was an all-day affair that began at the crack of dawn. Her dad would kill a chicken at first light, soak it and then it would be mum's job to pluck it when she woke up; a task that still haunts her to this day. Her mum would milk the cows and with the fresh cream, she'd make butter for the table. The potatoes, carrots, peas and herbs would be picked fresh from the garden. Another one of mum's jobs would be to shell the peas, which she'd do till her little fingers were sore. She needed enough for four people, after all. By the time the meal was served it would be would be two o'clock. Then came afternoon tea at four with a sponge cake, fresh out of the oven. And then it would be time for supper. A weekly ordeal! While it sounds idyllic with all that fresh produce, what a hell of a lot of work! All but the beheading was done by the women, while her father and brother would retire to the couch to read. Pah! What a long way we've come: I whipped up this roast in an hour and a half with only 20 minutes of prep time - and, to show how far women have come, I made Nic do all the chopping while I read the latest issue of Gourmet. And so it was that an hour an a half later we tucked into a delicious roast chicken with a lemon herbed butter. The butter consisted of fresh thyme, rosemary, parsley and grated lemon zest. When I roast a chicken, in order to get really crispy skin, I bake it on top of a wire rack that I fit over the baking pan. This way, all the juices run into the pan instead of having the chicken sitting in them while its cooking. The result: deliciously crispy skin! This week I will be submitting this recipe to Weekend Herb Blogging which is being hosted by Truffle at What's On My Plate. Hi. It's Nic here, once again invading Syrie's blog. While Syrie and I both share the cooking in the house, we are not equals. When Syrie cooks, it is a celebration. When I cook, it's a bit of a lottery. I don't use recipes and I don't really even keep a mental tab of what I'm throwing into the pot. So when, a little while ago, Syrie turned to me after eating a mouthful of a chicken dish I had just concocted and exclaimed how delighted she was, I was quite pleased with myself. She really meant it. My self-congratulation, however, was short-lived. Immediately after her compliment, she said, in an unmistakably threatening tone: "You had better remember how you made it." She really meant it. I was in trouble. 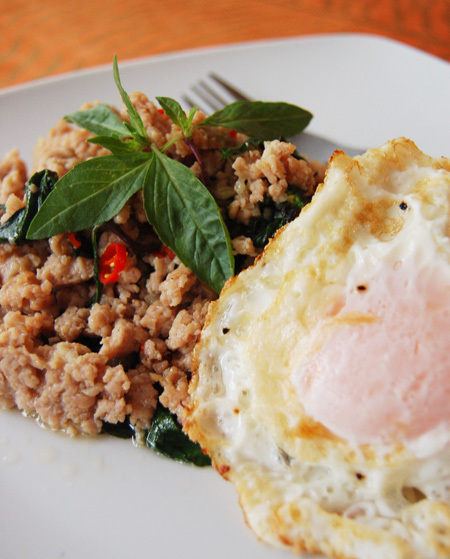 Gai Pad Grapow or Chicken Basil is one of the easiest and tastiest Thai dishes you can make. The key ingredient in this dish is the Thai Basil, which has a stonger smell than most Sweet Basils. Its leaves are small and it has a purple stem with a faint licorice aroma. Since we don't have a gas stove, I use a mini stove so I can really heat the wok up as this dish should be cooked quickly and on a high heat. It is a good idea to have all the ingredients ready and within reach as the actual cooking part only takes a couple of minutes. Last night we had a Thai feast in the park. Albeit a peasant feast but a feast nonetheless. 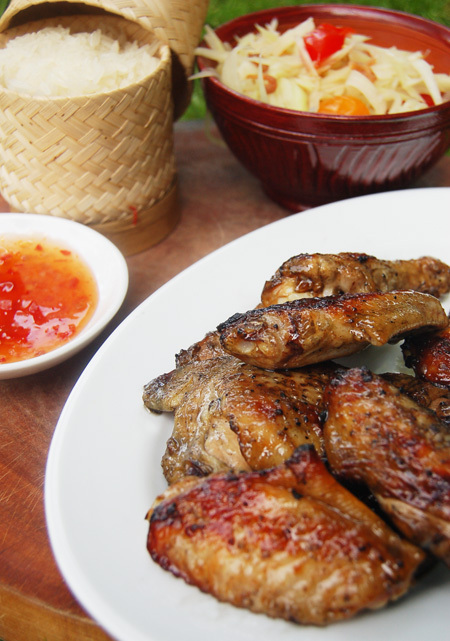 On the menu was Gai Yang, Som Dum and Kao Niew which translates to BBQ Chicken, Green Papaya Salad and Sticky Rice. These dishes come from the Issan region in North Eastern Thailand; the poorest part of the country, and are considered to be peasant food. Peasant food or not, I love it and whenever I am back in Thailand, I go to a famous little Gai Yang restaurant in Bangkok just to eat these dishes. I don't even think the restaurant has a name, so to get there you have to jump in a taxi and say 'Runahan Gai Yang, Soi Aree' (BBQ Chicken restaurant on Aree Street) and the taxi drivers know where to go. We bought this device at South China Seas Trading Co. at the Granville Island Market for a mere $16. No more mental binges about Kao Niew as I can finally make the real thing! 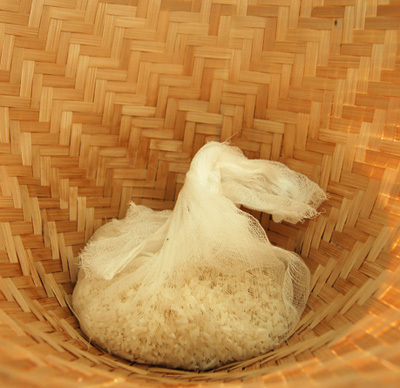 To prepare the Sticky Rice you need to soak it overnight in a bowl of water. You then drain it and wrap it in Cheese Cloth. Meanwhile, fill the urn with water about 3/4 of the way up the side and then bring it to the boil with the basket in it. 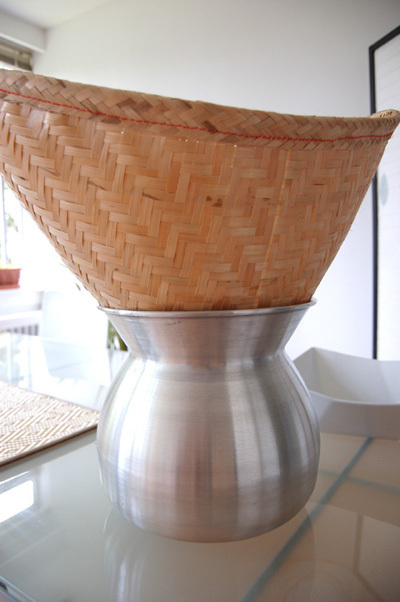 Put the rice wrapped in cheese cloth in the basket and cover it with a small lid from a pot. Steam it for 30 minutes and then carefully take the rice out and test it. The rice should be chewy. When serving it make sure you keep it covered as it can dry out quickly. In terms of cooking order, I made the Kao Niew last as it needs to be piping hot and moist, so keep that in mind. One of the restaurants I miss most in Sydney is Fatimas Lebanese restaurant on Cleveland Street, Surry Hills. A dark and narrow little place in need of some fresh paint, Fatimas is the spot to head at 3am for some late night nourishment. 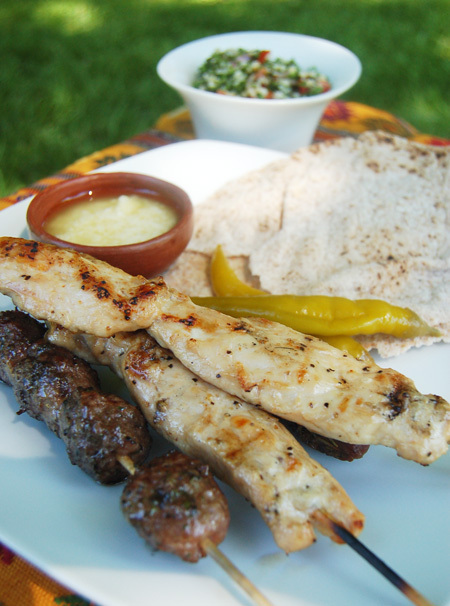 Actually, head there any time of day for fresh and delicious BBQ'd chicken skewers or lamb koftas. But what makes this place special is not just the succulent meats but the heavenly garlic sauce. It is simply spectacular and I think about it often! I don't know what they put in it as I have tried to replicate the secret recipe to no avail. Fatimas also makes the best falafels in town - plump, golden and garlickly, served with a side of pickled jalapenos and radishes. So that leads me to Thursday night's dinner...Chicken and Lamb Souvlaki skewers served with my version of the garlic sauce, Tabouleh and flat bread. Yes, there was some greek in there with the Souvlaki and that is because this time I actually cheated and bought the skewers from my local butcher as I didn't have time to marinate the meats. I buy my whole wheat flat bread from a fantastic Iranian shop near my apartment. The bread costs a mere 59c! There is just one more thing before the recipe...you might smell a bit garlicky for a little while. Not too long..really, just a few days.